Can you believe it is December already....19 days to Christmas & I am already feeling the Christmas buzz. That means a give-away is in order. With Creating keepsakes magazine recently launching two new bookazines, I think I'll have to give x2 copies away to some of you lovely blog buddies. This one scrapbooking tips & tricks: the stamp issue is jam packed with amazing projects, tips 'n tricks & techniques relating to stamping. It is a great issue! I have some projects in this issue too...here is a sneak of my page: Craft. If you’d like, you can also take a the peek of more of the mag online. 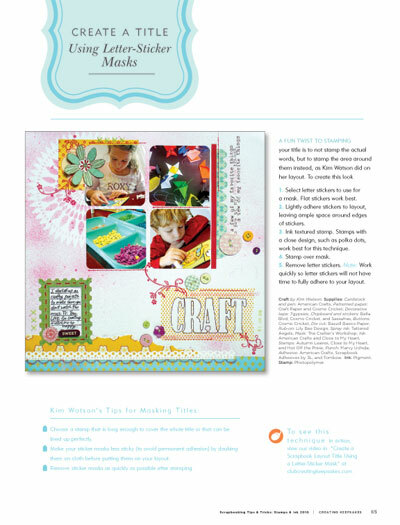 Then the next issue is one focusing on scrapbooking everyday memories. It is a fabulous issue, and is full of ideas about how to capture & record those everyday things our lives are filled with. You'll LOVE this one for sure!! 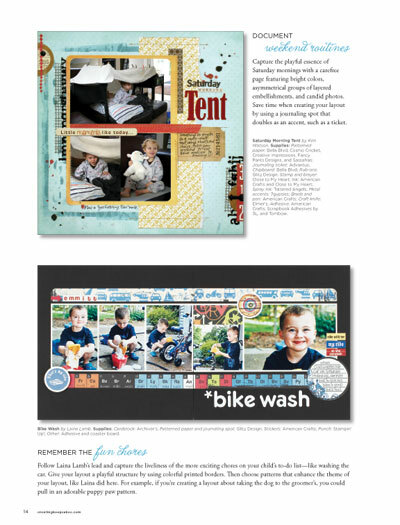 I also have some projects in this issue.... here is a sneak with a page called: Saturday morning tent. Keen to have a 'bigger' look inside? Well...you'll find the link to an online sneak! ENJOY! Now to clarify the details so you can have a chance to win, you must leave me a comment about 'what type of special issues you'd like to see Creating Keepsakes magazine bring out next year'. I will be closing comments on 10am EST Friday 10th, and will announce the winners on Friday afternoon. I also have a special coupon code to pass along. If you pop on over to the Scrap & Paper online shop use CKDT15, and you will receive 15% off all items in the store, through to December 20th, 2010. Just in time for your Christmas gift shopping. The everyday memories one looks especially captivating to me. Special issues: a photography tips and tricks...or PS elements how to. Creative ways to use up old supplies and stickers. Great giveaway! I would love to see a special issue dedicated to heritage photos and memorabilia....how to scrap it and keep it safe. Wow! I would love to see an issue on scrapping your travels! An issue on hybrid scrapbooking. Oooh looks good...it would be great to get some inspiration from CK for household decor projects! I would like to see a special issue on scrapping multi-photo layouts -- while still making them look artistic or cute! I agree with the heritage special issue. The 'Every day memories' looks great! I love stamps and ck has the best tips in those mags! I'd love a special issue freaturing photography tips and some basic editing say for pse. The stamping issue looks great! Thanks for the chance to win. Would love to see an issue, as others have mentioned, on PSE - just going into the basics but expanding a little more into some tricks. Also, going back to basic scrapping and getting it done, not focusing too much on the embellishments but more on the pics and stories. Wow these look great! Would love either one. I think an issue on scrapbooking on a budget/using things you have around the house would be a nice issue. I would love to see CK to a special issue on non-layout type projects like home dec, gifts, and cards! They look fun-so nice of you to do a give away. I need some fresh ideas. creative ways to use up stuff I've already bought! :) Thanks for a chance to win!! Great giveaway!Like some of the others mentioned I would love to see something Using old products, off the page itesm, and scraping on a budget. I would love to see an all boy special issue that isn't just baby boys or toddlers but preteen, teen and young man. Great Giveaway! I would love to see a CK issue on Mini Albums! It's fun to learn new techniques on different albums. Also, They're great to make at a weekend crop! I don't have either so I'd love either one of them! Thanks for the chance to win. What special issues I'd like to see? Travel, definitely. We do lots of it and my travel LOs tend to look similar. Simple scrapping. I'm a no-frills scrapper and many of the published LOs have a lot of embellies and fussy techniques. I'd like to get more ideas for the simple scrapping style. An issue of quick pages, 45 minutes or less, of clean, simple designs. Using sketches. Post a sketch, then several examples of how to interpret it. I would want a photography (or related) or a travel issue!! Thansk for being so generous!! I'd love these! I'd love a special issue about scrapbooking the everyday, the hard times, etc. Or one about two pagers specifically! I would love to see a mag featuring photography tips, and then layouts based on those photos. Hope that makes sense. LOVING the look of your blog lately. I'd like to see a special edition dedicated to focusing on journaling. Different ways of incorporating journaling into a page, perhaps some journaling ideas/prompts. I would like to see an embellisment or multimedia issue. I actually have 2 suggestions! 2) Focus on the story, journaling ideas. Layouts with less embellishments. PS. Your layouts are amazing! Well, the issue focusing on stamping is right up my alley. I would also love to see texture and layers incorporated or emphasized in an issue, as well as using existing supplies in a new or unique way. I think there could be an entire issue devoted to the uses of tissue tape, ha! i would LOVE LOVE LOVE to have that everyday memories mag! maybe it would get my scrappy mojo back on track! LOL! Great Giveaway!! I would love to see an issue showing how to get the collage effect on projects. The step by step of collaging/layering. Oh, I would love to get my hands on these! I always love reading magazines and idea books as they are so inspiring! I would love to see an issue about scrapping your toddler! I have a 16 month old, so I especially like ideas that involve kids since I scrap him mostly. I would also like to see an issue about a book of me. I am really wanting to start this in the new year and would love to see inspiration for it. And of course, using up my stash is always a good one! Hi Kim! I would so love to seem more super speedy layout issues - I just love those!!! I would like to see special issues about using punches, patterned paper and more ideas for all the stamps I have! Thanks for a chance to win! That's a hard one...I guess photography tips, even for those of us with point & shoot cameras. Simple ways to use PSE in your scrapbooking with tutorials. I think CK does a great job of covering a huge variety of topics. 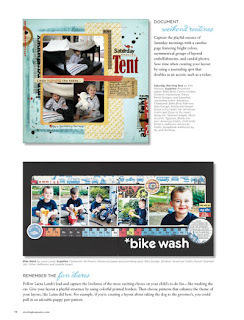 Would love to get my hands on the Scrapbooking Everyday Memories issue! That's something I need help with! WOuld love to see a Photography Issue - tips, tricks and then a mass of PS tuts! Things like adding photoframes etc. maybe ideas on using items we already have that are not necessarily scrapbooking materials... just stuff you have at home... being green and thinking outside the box. Thanks for chance to win. I would love, love to win these!! Love ideas from CK mags!!! I would love to see more pages about boys at the age of elementary school!! More pages without flowers! An edition with page ideas from etsy suppliers. More travel pages, without cars, airplanes embellishments. More travel pages about museums. Ideas for pages for places where there are not seasons such as Florida. For example how to do christmas pages with lot of snowman papers for places without snow. Things like that!! very cool. I would love to see punch art and paper piecing, that stuff is coming back in style. I'd love CK to come out with eco-green scrapbooking projects, and felting tips to make your own embellishments. I'd die for a copy of the newest CK idea books! I love magazines from CK. I subscribe to their bi-monthly magazine. It would be wonderful to win this special issues. I would love a special issue on how to create 3D embellisments. I love this magazines !! We have a bunny who looks JUST like the one the girl is holding in the cover photo of the 2nd book. Her name is Snowball. Anyhow...gosh, I guess I'd like to see more on recycling things to make gifts/projects, like the letters to hang on your wall, a box, or a pretty Christmas ornament. I tried to find these at the store yesterday and no luck. I think a fun idea would be embellishment making. How to use your scraps and scrap exclusively from your stash. I realize that doesn't help advertisers, but it would be a fun read and quite a challenge. Scrapping about "me" and journaling. I would love to see a book on Heritage layouts and one on off the page projects. I'd love to see a wedding issue. I know its not summer but for those of us who got married last summer it would be great cause I plan on starting my albums in the new year. As a new mom, I would like to see one on scrapping your children's milestones and cute projects that capture their youth, and gifts for family members. I would love to win the Everyday Moments Magazine. Thanks for the chance. This might just be what I need to get my creative juices flowing again! I'd like to see a CK mag with creative ideas to use ordinary stash in extraordinary ways. Something like Jennifer McGuire's aarticles in CK. I'd love to see an issue devoted to how to use punches- not just a heart punch but cut and it you get, combine it and you make, array it and you now have... I feel seeing how 1 product could be used in several different ways would help people make better pages. Ooooh, I'd love to see Mommy and Me 'themed" paper crafting ideas. Thanks for chance to win!! !